As a generation that’s grown up interacting with screens, the technological expectations of today’s students are understandably high. So much so that classroom video technology is hardly optional anymore, at any grade level. Lecture capture technology is part of that shift, whether for distance learning or online capture and playback, said Darrin Thurston, VP of product development at Vaddio. Despite the understood need for high-quality video resources in the classroom, challenges still exist. Those who work in the education market are used to fluctuating budget cycles and limited funding. One approach that’s been successful for integrator VCA, which has seen recent growth in its work with higher-ed clients, is standardization. For K-12 environments, whiteboards remain one of those standard and reliable options. When interactive technology is the goal, connecting students’ individual laptops or working on files in real time is key, and deploying multiple whiteboards across a campus may provide a simple, straightforward approach that appeals to an education client. The 70-inch JTouch allows multiple people to write or draw at the same and then view and annotate over PowerPoint, Word, or images. Touch control is likewise an option in Jamboard, the interactive whiteboard from BenQ, which adds cloud-based G-Suite integration to the mix, so educators can easily access materials stored in a Google Drive, and instantly save any changes that are made. Sharp’s PN-C805B AQUOS Board, at 80 inches diagonal, enables similar real-time information sharing at a size that may be just the right fit for larger classrooms. Another large screen is the 84-inch LG TR3B Series, with Ultra HD resolution, plus pp-scaling and Super Resolution technology to enhance the quality of 1080p content to near-UHD quality. Collaboration and scale are also key when it comes to projectors. The multi-touch interactive capabilities of Epson BrightLink interactive projectors, for instance, support the use of two stylus pens and up to six fingers at a time, all while projecting a display of up to 100 inches. The BrightLink is available in models featuring up to 4,400 lumens. 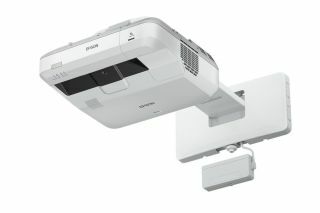 Other ultra short-throw interactive projectors include the Sony VPL-SW631 and Hitachi CP-TW3005 at 3,300 lumens, the BenQ MW855UST at 3,500 lumens, the NEC UM361X at 3,600 lumens, and the Optoma EH320UST at 4,000 lumens. Space savings is also an upside to interactive projection technology, noted Tom Piche, product manager, education projectors, Epson America. A big challenge for the education market will always be endurance. Unlike corporate clients who may be able to upgrade a system as their needs and spaces change, schools often have a longer time between AV installs. As a result, many clients in the market are requesting equipment that will deliver a big (and long-lasting) bang for their buck—though, at the moment, it’s a considerable number of bucks. Mary Bakija is a writer and editor based in Brooklyn, NY.